We recently received a long awaited shipment of parts. 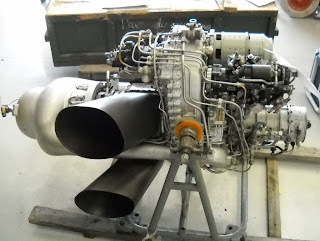 One of the items received was a replacement engine for one of our Cold War Air Museum. 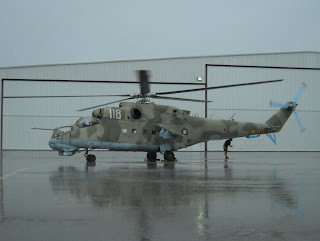 Mi-2 helicopters. This turned out to be an example of "Just in Time" scheduling for our flyer, Bord 211. 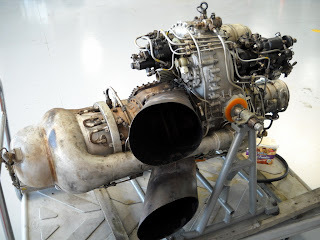 There is a saying to the effect that "The worst turbine engine's worst day is better than the best piston engine's best day", even so, turbine engines do have problems from time to time. It turns out that this was the time for the right engine in Bord 211. When a bearing went out, the comment was that it sounded as if "the engine ate a bunch of walnuts". 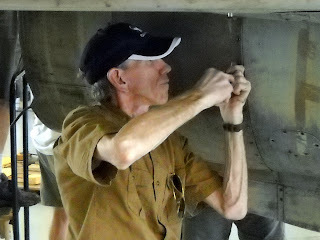 Fortunately the engine did not "eat a bunch of walnuts", as the turbine blades are fine. With a maintenance crew on hand, the old engine was out in about three hours and the new engine went in just about as quickly. With maintenance and flight experience on hand. The new engine was closely monitored through a number of exercise cycles before it was ignited. After a number of runups with the igniters off to insure that everything looked good, the new engine was started and ran flawlessly. 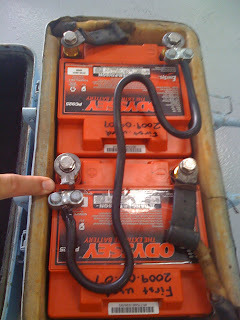 The long "extension cord" is a very heavy duty APU power cord used to supply battery power during the engine exercise and starting sequences. The old engine will be inspected and repaired. The Goldenheart Foundation works with the Dallas Schools, especially with the Jr. ROTC programs, to expose them to role models and career opportunities. 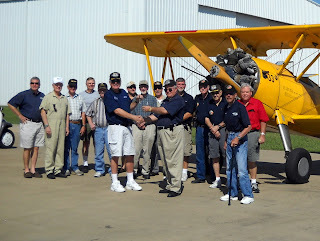 The Commemorative Air Force, DFW wing and The Cold War Air Museum have helped the organization bring several of these South Dallas events to the Lancaster Airport over the last few years. As is appropriate, the events always begin with a flag ceremony. This event was estimated at over 700 people, slightly exceeding the career day in May. These events are generally scehduled around the start and end of each school year. The F4U is a poignant background for the Navy information table. Services, academies and colleges display and recruit at these events. The Mi-24 in the CAF hangar serves as a backdrop for the Air Force Academy table. 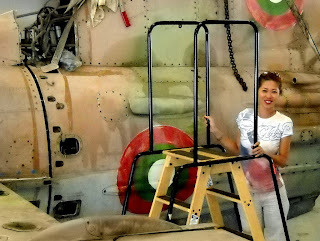 While the kids may not know the history of the Mi-24, they understand about air power from all that they have seen on TV and at the movies. 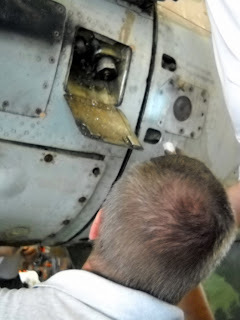 Pete helps answer questions and lets the youngsters take a peek in the cockpit of our L29, a former Soviet jet trainer. While it doesn't seem as if the kids are as interested as "our" generation (of fifty years ago), prior generations did not have the stimulus rich environment of TV, games, movies and the internet that causes them to take so many of our modern marvels for granted. A few of the kids asked questions and showed interest as we did when we were young. That is why we are here, today. 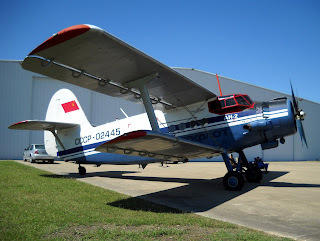 The Antonov came to the event and while few of the kids took the opportunity to learn of the use and history of this unusual bird throughout the U.S.S.R and China, those of us parked in the sun appreciated the sight of an airplane/exhibit that brings its own shade. One of our associates came across a picture from his younger days. 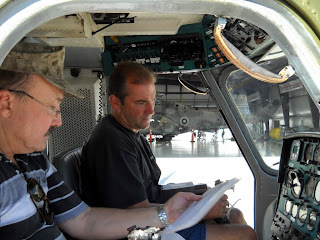 With the sun glaring off the plexiglass, you will have to take our word for it that Pete is in the left seat. This photo was snapped in 1969 while he was engaged in some daily flying in Southeast Asia. 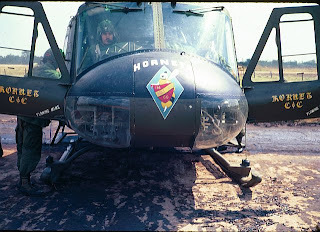 His unit was the 116th Helicopter Company, "Hornets". The squadron logo is on the nose of the aircraft. This particular bird was used for Command and Control, supervising ground activities. Beside's looking pretty spiffy, logo's, emblems and patches help to identify an organization, its members and its mission. And, they are special to those who wear, or who have worn them. The Cold War Air Museum is considering different patches and emblems like this one to help identify our aircraft, members and mission. Continuing our coverage of the 9/05 event. 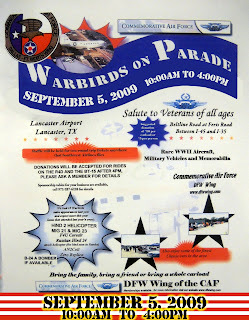 The Commerative Air Force (CAF), DFW wing has co-ordinated this annual event for a number of years. 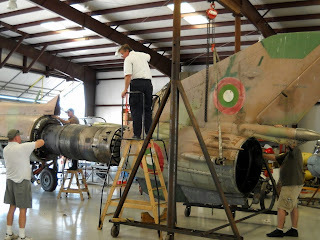 The Cold War Air Museum is pleased to work with the CAF to help host this fine event. The CAF hangar served as the focal point for visitors and displays. This year's attendance exceeded that of prior years. 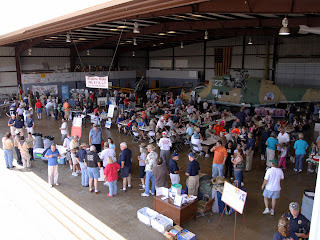 This aerial shot in the morning shows some of the activity that went on and expanded throughout the day.The Cold War Air Museum relocated their Mi24 Hind helicopter, Mi2 Hoplite helicopter, Mig21 Mongol fighter as well as our L29 and L39 Delfin and Albatross trainers to the CAF ramp for the event. This helped with crowd control and created a dense and interesting series of aircraft displays when combined with the CAF aircraft. 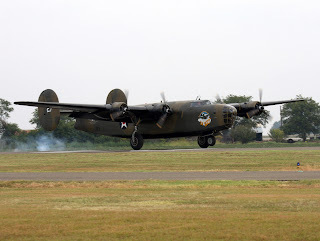 A highlight of the event was the arrival of the B24. With only two currently flying in the U.S., this was a standout event for this show. 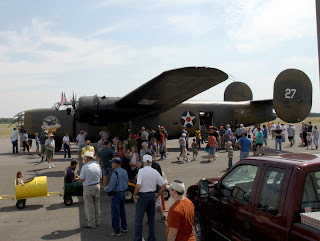 There was always a crowd around the B24 and every time it flew, more people arrived. 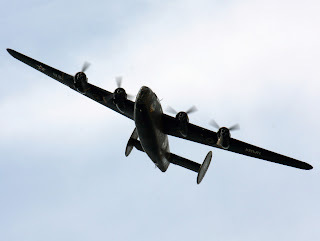 The B24 flew frequently during the event and the sight and sound was awesome. Hats off to Charlie who made it all happen. As wing commander of the CAF group and a generally all-around great guy, we appreciate having the opportunity to work with him. There will be more posts and pictures coming out on this event with some other posts in-between. 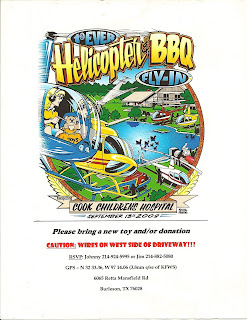 To aggregate the posts and pictures from this event, click on the 090509 label below. 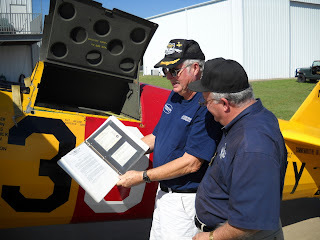 We have been waiting to post the after event follow up from the 9/5 Warbirds on Parade event until one of our friends, Kevin Hong, a professional photographer, had a chance to send us some of his pictures. More of his work can be found at www.sectorkmedia.com. With credit and thanks to Kevin, here is some coverage from the event. 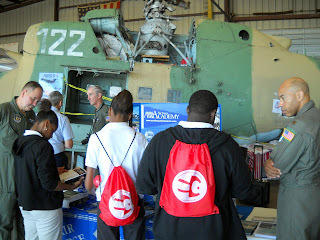 The Cold War Air Museum, Mi-2 was a hit at the Lancaster event. 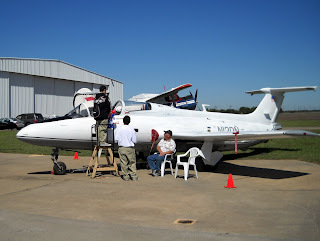 People lined up to see the inside and learn more about the aircraft. Operating from the field next to the ramp, the bird looks just as at home as it would on the Russian steppes. With the B24, the signature aircraft of the event in the background, all the right sights and sounds were on hand for the visitors. 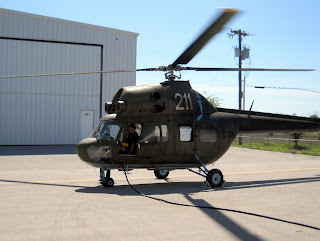 The turbine engines on the Cold War Air Museum, Mi-2 use an electric starter and the original batteries in the original aircraft have been replaced with sealed batteries of higher capacity. In the preliminary wiring of the battery modules, we used some light duty automotive terminals that were readily available. After a series of starts, we found that these particular connectors were "self fusing" at a load close to the start demand of the engines. After enough starts, the terminals cried "enough!" and disconnected themselves. 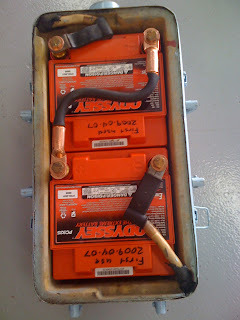 The series links inside the battery boxes have now been replaced with heavier gauge wiring and terminals. Texans love their barbecue and don't really need an excuse to have one. 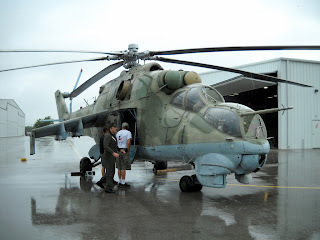 If the gods of weather, planning and maintenance concur, on Sunday the Cold War Air Museum, Mi-2 will visit this event and we will have some "live" coverage returns in future blog posts. The event supports a good cause and we are hoping for its success so we can plan similar events in the future. 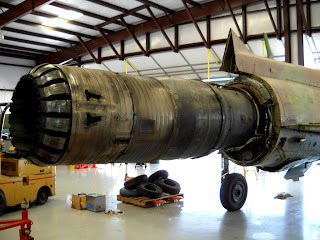 The Cold War Air Museum, Mig21 wheels and brakes are massive, as you might expect. The size of the wheel allows a larger brake assembly to be housed inside, provides more area for heat dissapation from the brakes and allows for a larger dianeter tire to provide more tread area to absorb high landing wear. 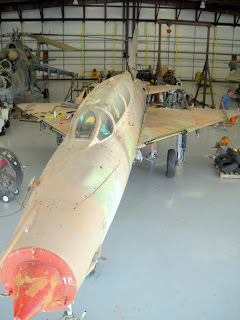 The Mig lands at about 200 mph (330 kph) and a set of tires may typically last for only ten landings. In earlier and smaller aircraft,drum brakes were used. Disk brakes were developed when military and commercial aircraft got larger and faster and needed more efficient breaks to stop on reasonable length runways. This brake stack has four rotor plates that rotate with the wheel and five stator plates that remain stationary with the wheel hub. 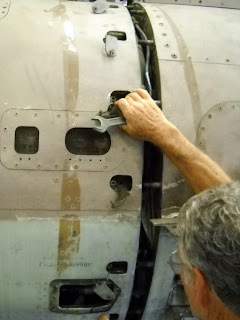 The tabs on the rotor plates must be lined up and slid into the grooves on the inside of the wheel rim shown above. That is what causes them to rotate with the wheel between the stationary plates. When pressure is applied to the stators, the moving and stationary plates are squeezed together eventually bringing the wheel to a stop. All of the excess energy from the speed of the aircraft is turned into heat. Brakes get very hot after a landing and must be allowed to cool before another landing cycle. Most of the jet aircraft at the Cold War Air Museum were equipped with ejection seats when they were in military service. One of the first actions on arrival is to check and insure that these seats have been disarmed or disabled. While this makes the aircraft safe to work on and to move around in, it begs the question- “Hot or Cold”? Should the seats be “hot” during flight or “cold”? Because the use of the ejection seat has a training requirement prior to useage, the consensus has been to leave the ejection seats “cold” and rely on the robust nature of the airframe and the skills of the pilot should an emergency occurr and require an emergency landing. After all, no one is shooting at us over Lancaster. In fact, the general consensus is that barring an on board fire, or the total loss of control function, the occupants are better off “riding it down” in the event of an emergency as the aircraft we fly are exteremely durable and robust. 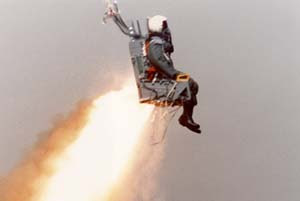 But enough of this, lets talk about where ejection seats came from and how they were developed. A bungee-assisted escape from an aircraft took place in 1910. In 1916 Everard Calthrop, an early inventor of parachutes, patented an ejector seat using compressed air. The modern pattern for a plane was invented by Romanian inventor Anastase Dragomir and its design was successfully tested on August 25, 1929 at the Paris-Orly Airport near Paris and in October 1929 at Băneasa, near Bucharest. The first ejection seats were developed independently during World War II by Heinkel and SAAB. Early models were powered by compressed air and the first aircraft to be fitted with such a system was the Heinkel He 280 prototype jet fighter in 1940. After World War II, the need for such systems became pressing, as aircraft speeds were getting ever higher, and it was not long before the sound barrier was broken. Manual escape at such speeds would be impossible. The United States Army Air Forces experimented with downward-ejecting systems operated by a spring, but it was the work of Sir James Martin and the British company Martin-Baker that was to prove crucial. Early seats used a solid propellant charge to eject the pilot and seat by igniting the charge inside a telescoping tube attached to the seat. Effectively, the seat was fired from the aircraft like a bullet from a gun. As jet speeds increased still further, this method proved inadequate to get the pilot sufficiently clear of the airframe and increasing the amount of propellant risked damage to the occupant's spine, so experiments with rocket propulsion began. The F-102 Delta Dagger was the first aircraft to be fitted with a rocket-propelled seat, in 1958. Martin-Baker developed a similar design, using multiple rocket units feeding a single nozzle. This had the advantage of being able to eject the pilot to a safe height even if the aircraft was on or very near the ground. 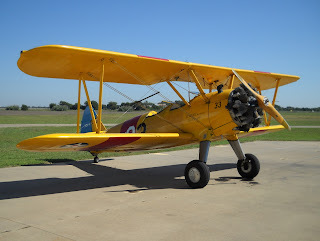 Saturday, September 5th, the Cold War Air Museum will be participating with aircraft flying and on display along with the Commemorative Air Force DFW wing. 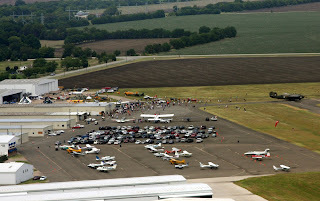 The airport will also be hosting other aircraft and events. Many of our aircraft including the Mig-21 will be on static display next to the CAF hangar so that all activities for the public will be concentrated towards the North end of the field. In addition to the parking areas shown on the link below, there will be additional parking in designated areas on the main ramp during the event.